As people are looking for a new home, they often have a wish list in hand of things that they're wanting. Near the top of their list is usually ample closet space. And we get it - it's the perfect place to store everything from clothes to vacuums to bedding to keepsakes you want to hold onto for years to come. In the event that you're not upgrading your home but still need more storage space (Who doesn't? 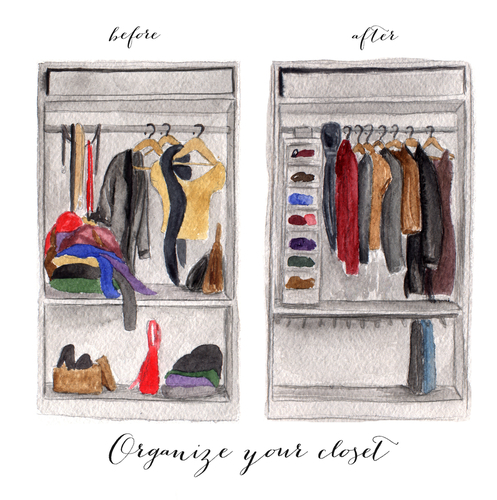 ), we've put together some ideas for helping you make the most out of your closets. Mounting peg boards on the inside of your closet doors can give you instant extra hanging space. Add some 'S' hooks to attach belts, scarves, necklaces, or a mirror in your bedroom closet. It's an instant vanity station. An over-the-door rack (with shoes or shelves) also utilizes unused space behind a closet door. Purchase slim, see-through plastic shoe holders (which stack compactly) to put on shelves in your closet. It offers an inexpensive alternative to built-ins. If you don't want to spend the money on the shoe holders, you can use the boxes that your shoes come in. Print out pictures of the shoes and tape it to the front of the box so that you can easily locate what pair of shoes you might be looking for. Clear plastic drawers make perfect storage quarters for neatly-rolled scarves, underwear, socks or belts. They come in various sizes to fit under (or beside) your hanging clothes in the closet or under your bed if you really lack closet space. One smart solution to a storage crunch is to add a customizable unit of wire (or mesh) shelves to hang inside the closet. These spaces are great storage for folding jeans, t-shirts or sweaters (which take up less hanging room for your other clothes). If you're really tight on space, one way to save every inch you can is to purchase the slimmest hangers you can find. Although the really nice wood ones are great for taking care of your garmets, they're not great when it comes to space. When every inch counts in closets, thinner hangers = better. Group clothing by category?dress pants, jeans, casual shirts, work tops?to make putting together outfits easier. Or - if you prefer - organize your closet by color, such as light to dark. It may not save you space necessarily, but it will make it more organized. An armoire provides extra storage space in the bedroom; use baskets in open spaces to collect odds and ends. Or you might consider putting extra cabinets near the top of other rooms - like in the bathroom. Sliding library ladders can help you access whatever you store there. To streamline your space, constantly eliminate clutter: Every three to four months donate unused items to charity. Not only will it keep your closet space more clean, you get to write off the donations on your taxes. Even if you don't have a ton of closet space, there are ways of making the most out of what space you do have. What ideas do you have for making the most out of your closet space? Let us know in the comments below!